WhatsApp Rolling Out Dark Mode With New Update, First Look: The most popular and fastest growing instant messaging app Whatsapp has 1.5 billion of user base and still growing as you read this article. Time to time WhatsApp has surprised their users with all new features and functions. This update chain may be the prime reason to make user stay stick to the Facebook owned WhatsApp. WhatsApp is well known for its upcoming updates and all the updates gives user a new experience and keeps them motivated to stick to the app. This time WhatsApp is is planing to surprise its users with all new “Dark mode“. Recently Video platform and second largest search engine over internet YouTube, has introduced the “Dark mode” on PC and Mobile version. 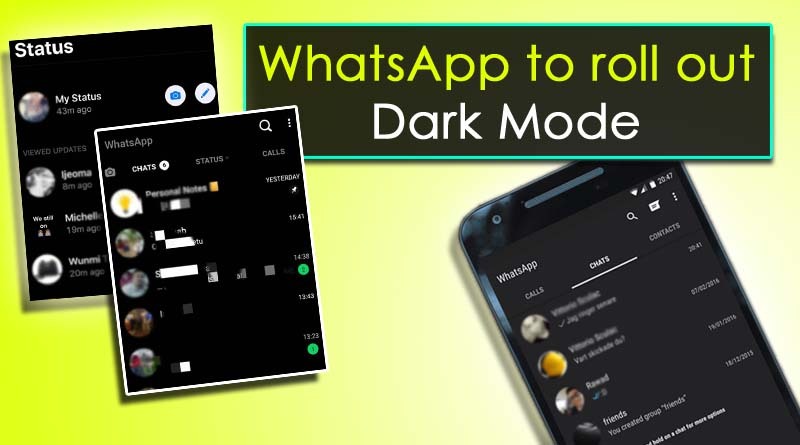 Inspired by YouTube Dark “theme mode“, WhatApp is planning to roll out all new “Dark mode” for Android and iOS platform. However, it is not clear if the “Dark mode” will be available for web version or not. Initially this “WhatsApp Dark Mode” will be available for beta users only. If everything goes as per plan and based on the feedback, WhatsApp will finally release the “Dark Mode” for all users including Android and iOS. Get updates from WhatsApp, Facebook, Smartphone, Trending news from Entertainment and Technology industry. Make sure to subscribe our feed.